Choosing the right bathroom or kitchen aerator is one of the easiest steps you can take to save water. However, selecting the right aerator can be challenging because there are so many different flow rates and sizes to consider. A bath aerator typically screws into the faucet spout so it needs to be the correct size and threading. We’ve listed four factors to consider to help your narrow down the aerator that will meet your needs. This is probably the most important factor to consider since it will determine if the aerator will fit your faucet spout. The threading will depend upon which country you are in. The first thing to determine is if you need female or male threading. 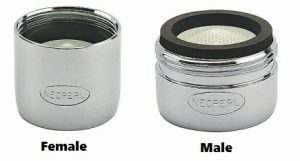 A female aerator has the threads on the inside of the aerator, while a male aerator has threads on the outside of the aerator. In the United States, the thread size are 55/64″-27 for standard-sized female and 15/16″-27 for standard-sized male. A dual thread aerator is very flexible in that it allows you to fit into both male and female threaded sprouts since it has threads on both the inside and outside. A low flow aerator helps you realize water savings by restricting the water flow rate. To be classified as a low flow aerator and have industry certifications such as WaterSense labeled or CalGreen compliant, it should have a flow rate of less than 2.0 gallons per minute (gpm). The technology has improved significantly to compensate for fluctuations in pressure, so that a low flow aerator does not feel like it’s not delivering sufficient water. To seriously cut down on water usage, consider a flow rate of between 0.5 gpm to 1.5 gpm. A low flow bubble faucet aerator restricts the water flow from the faucet. This type of aerator adds air to the water flow to enhance the water stream to give the sensation of a larger flow even though it’s dispensing less water. It is ideal for use in both bathroom and kitchens. A bubble faucet aerator typically has a cross mesh screen to act as a flow restrictor and aerate the water. A needle spray aerator produces a shower like pattern when dispensing water. 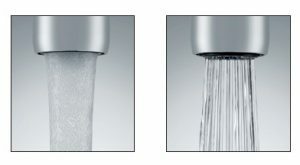 Needle spray aerators are the only choice when you are selecting an ultra low flow faucet aerator e.g. 0.5 gallons per minute (gpm) or lower. Needle spray aerators provide a good coverage of water when washing hands and so are often preferred in commercial applications. They have tiny holes around the base of the aerator through which the water is dispensed. A Laminar Stream delivers a non aerator stream. It is typical found is hospitals/health care facilities where a strong non splashing stream is desired. Aerators come in 3 different sizes : regular size, junior or small size and tom thumb size. The regular size is the largest and the housing is the size of a quarter, the junior/small size is the size of a nickel, and the tom thumb is equivalent circumference of a penny. Keep these factors in mind and you’ll spend less time worrying about returning those wrong aerator, and more time enjoying the extra money you’ll be saving on water savings with a low flow aerator.